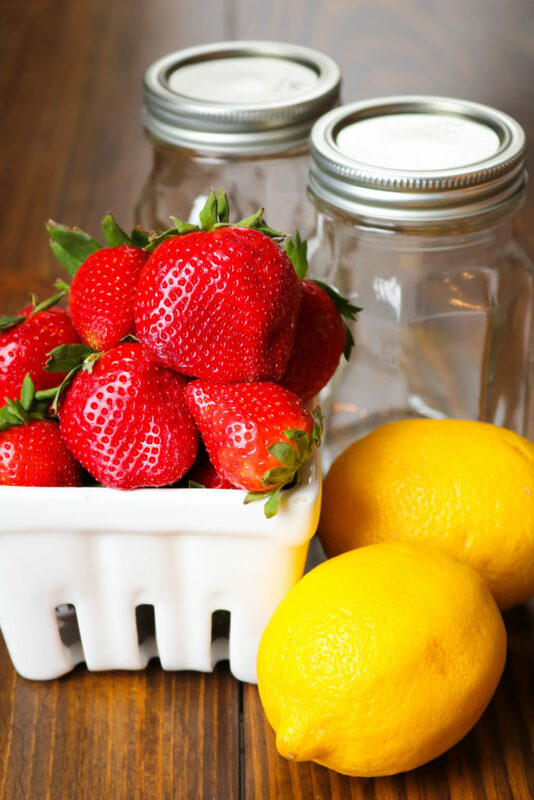 Strawberries and summer lemonade stands come together to create this delicious Strawberry Lemonade Jam. Tastes yummy on biscuits, in a peanut butter and jelly sandwich, or on toast. 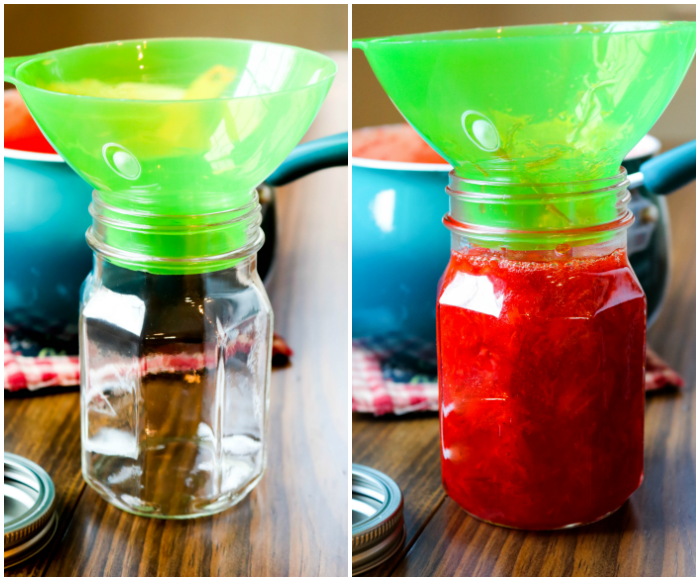 Plus, there is no fancy canning equipment involved! Refrigerate for up to 3 weeks or freeze up to 1 year. I love strawberries and I love lemonade. Put those two things together and you’ve got one of the best homemade jams that I’ve ever made in my kitchen, the most glorious jam to spread on a fresh biscuit and hopefully a homemade jam recipe that you’re going to want to write down or print and save for your own recipe box. 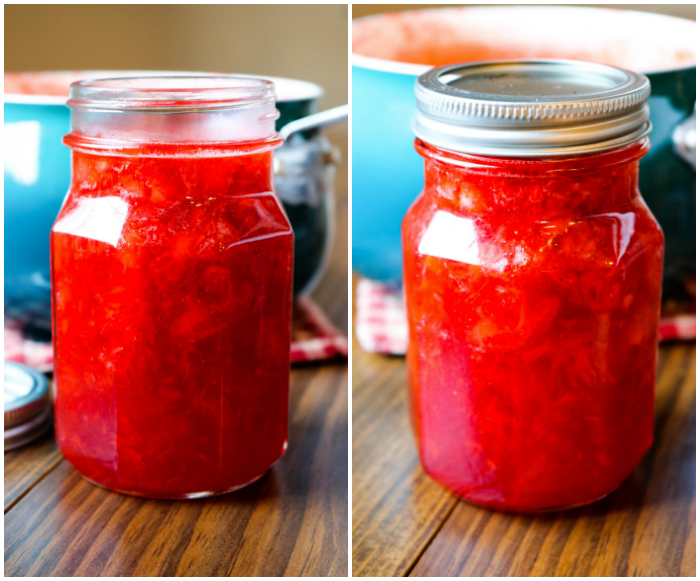 I’ve always been crazy about strawberries and now that I’ve been working on some strawberry jam recipes even more this year, I decided to try my hand at growing strawberries too! I’m nervous but excited to see if I can do it. Even if I fail at growing them I know I’ll still be picking up tons of them at the farmer’s market and at the local pick your own strawberry farm! 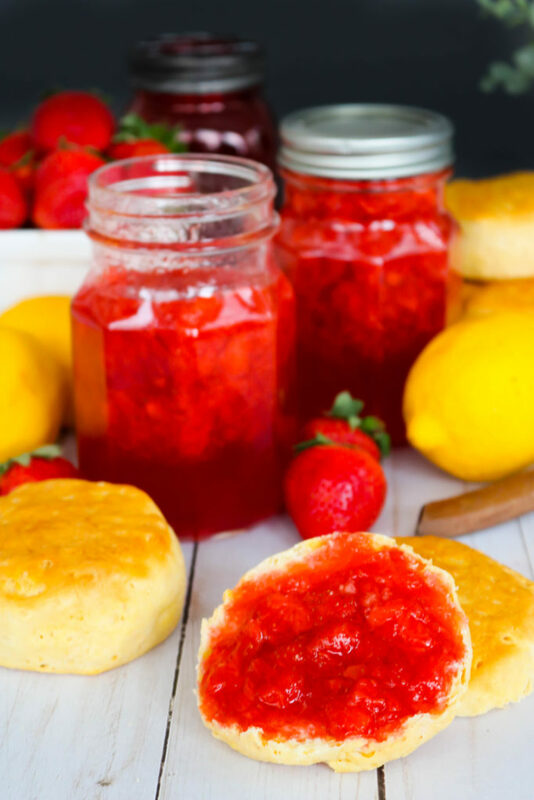 So go ahead and grab some strawberries and lemons and fall in love with this Strawberry Lemonade Jam! Ps. 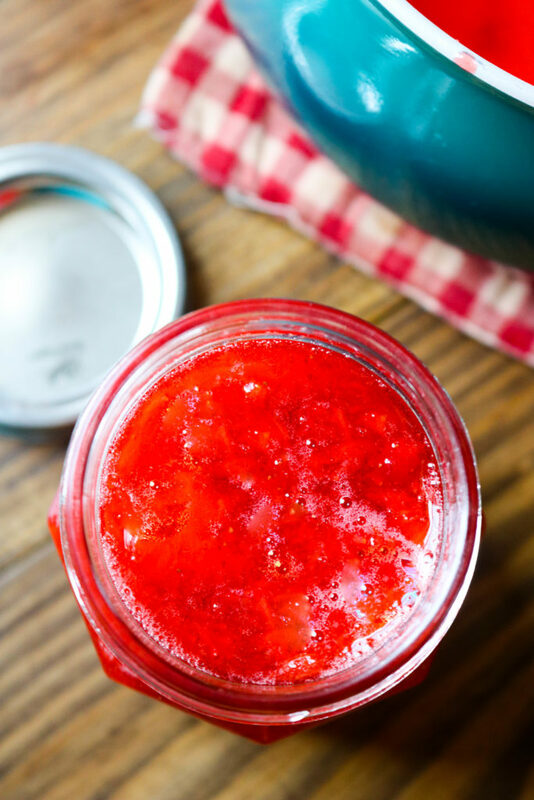 I’ll have the recipe for my Strawberry Vanilla Jam on the blog soon too! 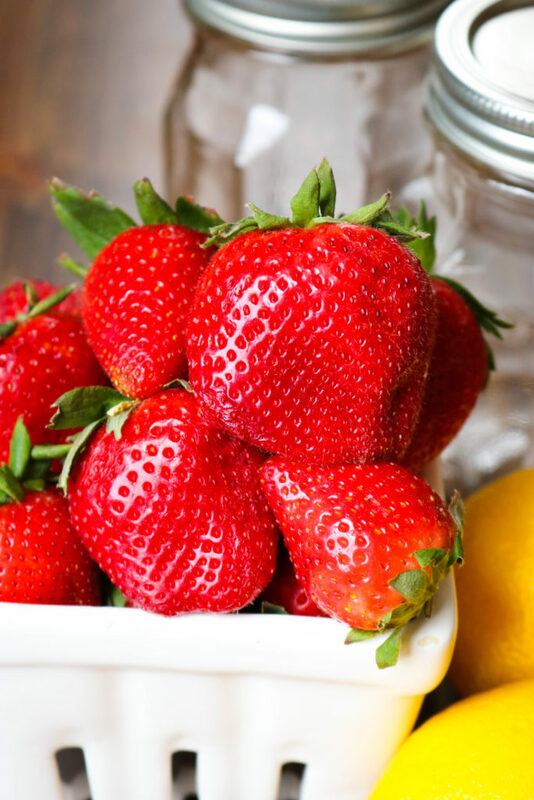 When you’re going to be snacking on strawberries or making homemade jam with them you want to make sure that you’re really picking out the best ones you can find in order to get the best flavor! Strawberries are ALWAYS sweeter and better when they’re picked fresh and in season. Around here that’s during the summer, down in Florida it is earlier and I’m super jealous of them every year haha. Before you make this jam you’re going to need to hull the strawberries. What does it mean to hull a strawberry? It basically means that you need to remove the leaves and the bit of white core right below the leaves from the berry. Now you can take a little pairing knife and carefully cut around the base of the greens at an angle and hull the strawberries that way. Or you can use the straw method, which is how I like to do it. I think it’s much easier and faster to hill strawberries this way. 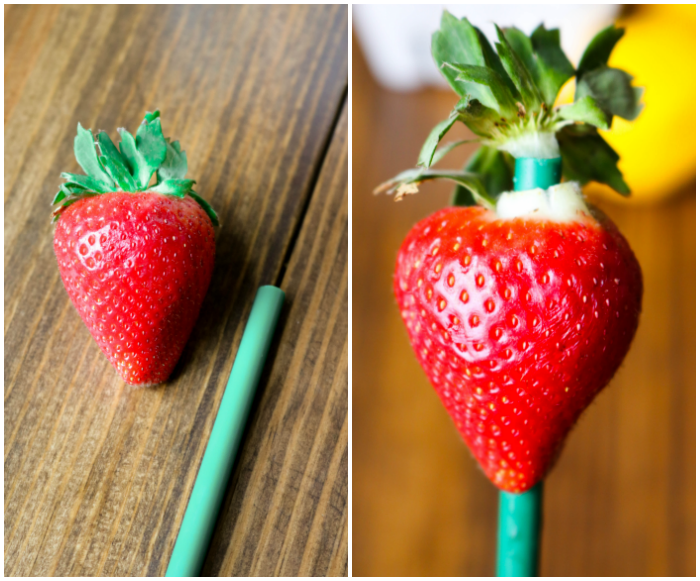 Just take a straw (I use a plastic reusable straw) and place it at the center of the bottom of the strawberry. Then just push up through the strawberry and pop the leaves right out. 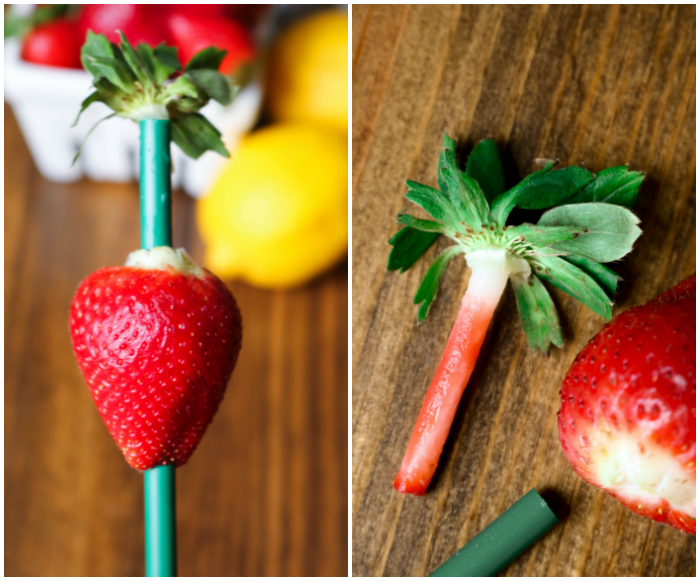 I just keep going until all of the berries are done and then I use a chop stick or a kabob stick to push the strawberry parts out of the straw. If you use a disposable straw you can just toss the straw but I like the durability of the reusable straw and I like to save the centers and leaves for my compost bucket. I like pieces of berry in my jam so I use a potato masher to smash the berries before cooking them down. You can also use a fork or a food processor but I don’t really care for those methods. 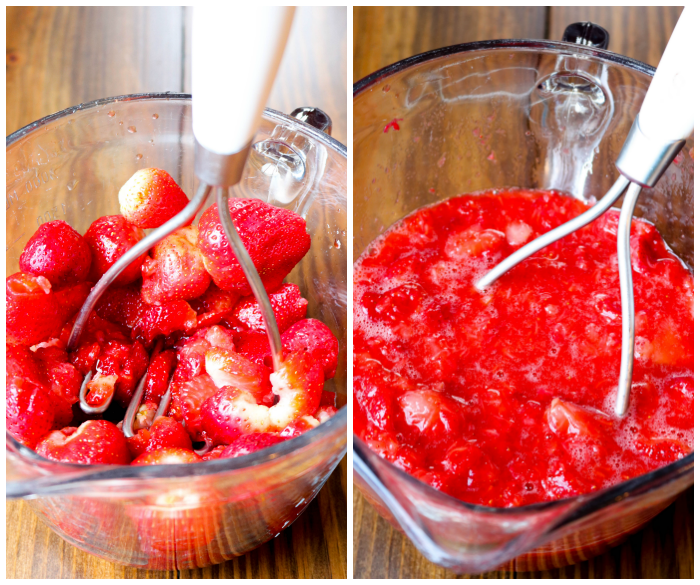 The potato masher for mashing strawberries for Jam is the way to go in my opinion! Lemon Juice: Squeeze it fresh, don’t use bottle lemon juice. Squeezing fresh lemon juice is super easy and it taste so much better than lemon juice that comes in a bottle that’s been sitting on a shelf forever. I found this little lemon juicer at Marshalls for like $3.00 and it’s come in handy quite a bit but you can also just cut a lemon in half and squeeze the juice out that way too. If you juice the lemon by hand just remember to hold the cut side up so that the seeds don’t fall into the jam. 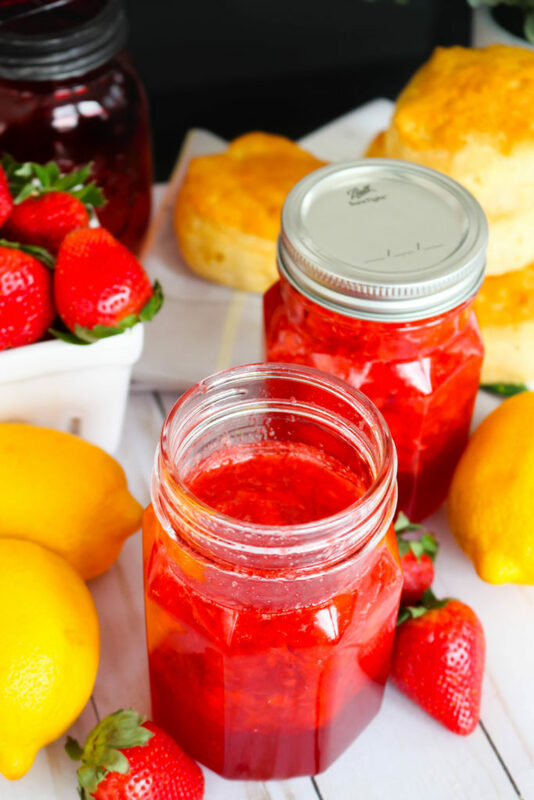 This strawberry lemonade jam only requires a few minutes of cooking. 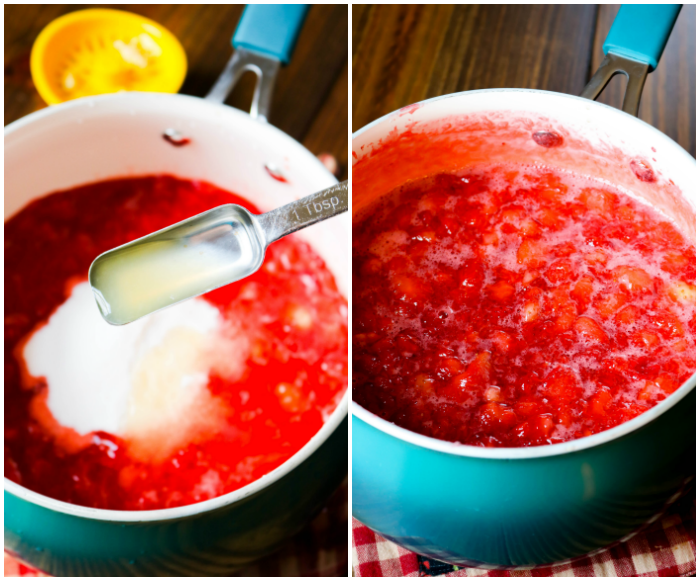 Once you’ve added the mashed strawberries, lemon juice, pectin and sugar to the pot and boiled it for a bit and left to cool for a few minutes, the jam will be ready to pour into jars! Here is your opportunity to taste test the jam before adding it to the jars! This is where you can get an idea of what it’s going to taste like as a finished product and decide if you want to tweek the sugar or lemon juice. Make sure that the jars are clean and that you have lids for each one. 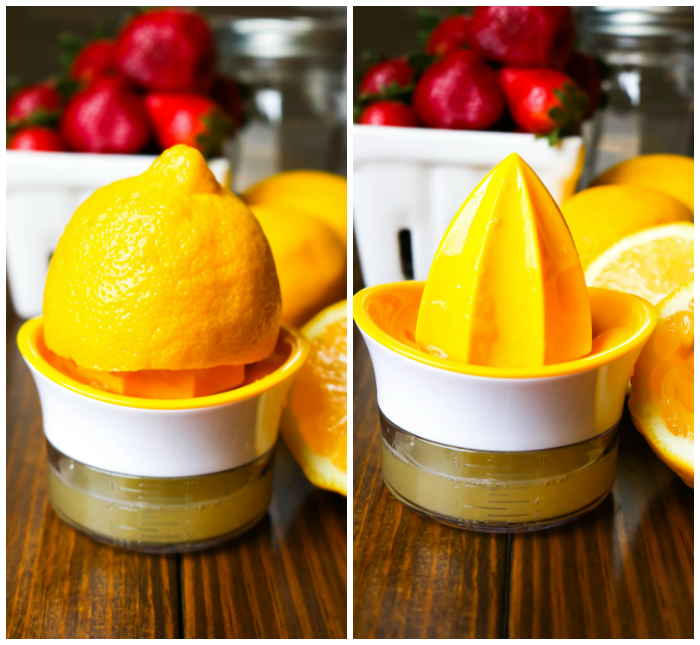 Use a wide mouth funnel to make it easier and spoon the cooled but warm jam into each jar. This recipe will fill 3 – 16 ounce jars. 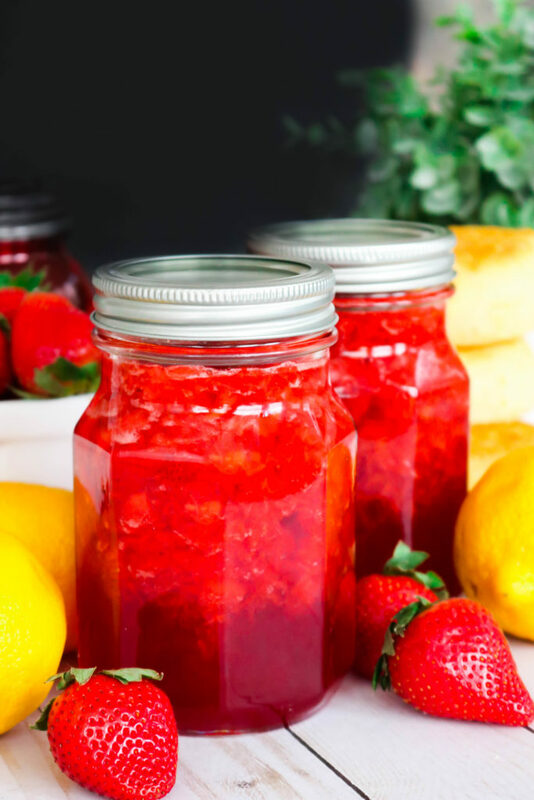 Make sure to leave about a 1/2 inch space between the jam and jar so that it can expand if it goes into the freezer. 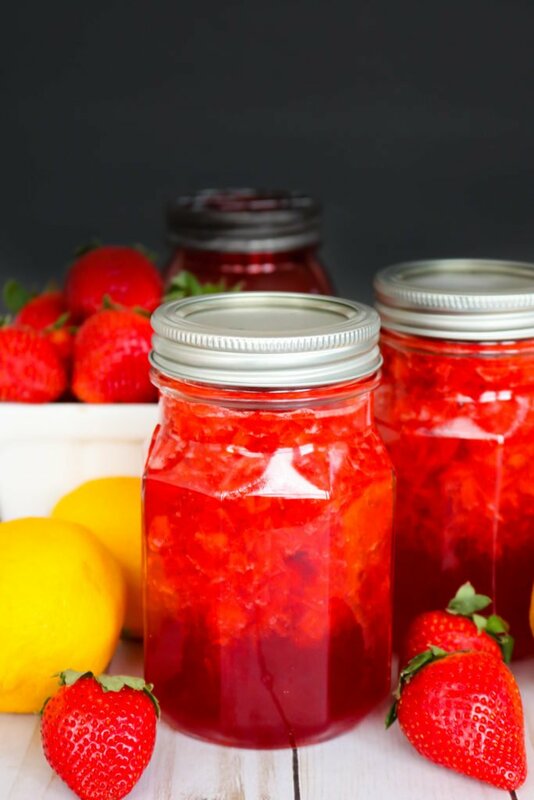 Once the jars have been filled with this fantastic homemade strawberry lemonade jam, wipe the rims clean and screw on the lid to each jar. That means that while this jam is going into jars it isn’t being sealed for canning and pantry storage. There are tons of recipes and directions out there on how to do that method but I am still too nervous about boiling jars and making sure that I’m doing it right to try it out on my tasty jams yet. This jam can kept in the refrigerator for up to 3 weeks or it can be frozen for up to 1 year. Now it’s time for the fruit and pectin to work it’s magic inside the jars and transform into ready to eat jam! Sit the jars on the counter, not in direct sun light, and let them rest undisturbed for 24 hours. After the 24 hours is up place the jam either in the fridge or freezer! It’s ready to eat! I love strawberry but don’t like lemon. Can I leave it out? Can I use this method to make other jams? Can I use the boiling method with this jam so I can store it in the pantry. You can! If you are a caner and want to can this jam that way it will work.